This past summer my wife and I had the opportunity to travel through Montana, so she graciously allowed me a detour through the beautiful Bitterroot Valley in the Southwestern corner of Montana, just a few miles South of Missoula. The goal was two fold. To document the two remaining buildings designed by Wright in the Como Orchard Summer Colony, University Heights in Darby, and to locate the original site of the Bitter Root (S.145) North of Stevensville. They were two separate projects, financed by the same company, the Bitter Root Valley Irrigation Company, but are physically over forty miles apart. These two, along with the Lockridge Medical Clinic in Whitefish (S.425) (1958) make up the three Wright projects in Montana. In preparation for our visit to the original site of the Como Orchard Summer Colony I contacted the present owner of the property, Charles Roland. Unlike the "cold inhospitable place" discovered by Lewis and Clark in September 1805, I found the Bitterroot valley beautiful and inviting, actually commenting to my wife that this would be a beautiful place to retire. Driving from Hamilton to Darby early Saturday morning, I was overwhelmed with its beauty. Norman Maclean’s "A River Runs Through It" was written about life during the early twentieth century in Missoula, on the Northern end of the Bitterroot Mountains. As I parked, two deer were grazing not more than 30 feet away. Charles graciously gave me a guided tour, and then allowed me access to the two remaining Wright buildings. 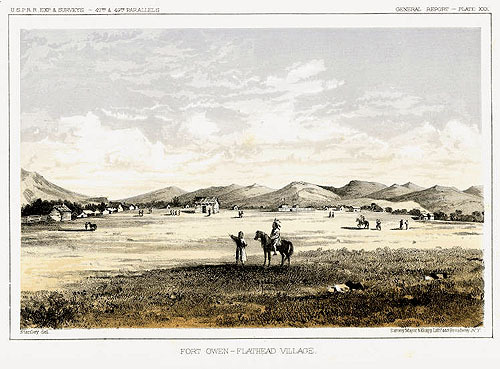 Stevensville was the first permanent settlement in the state of Montana. It was settled by Jesuit Missionaries at the request of the Bitter Root Salish Indians. Through their interactions with the Iroquois between 1812 and 1820, the Salish leaned about Christianity and the Jesuits that worked with Indian tribes teaching them agriculture, medicine, and religion. In 1831, four young Salish men were dispatched to St. Louis to request a "blackrobe". They were directed to William Clark (Lewis and Clark). At that time Clark administered their territory. During their trip two of the Indians died at the home of General Clark. The remaining two met with Bishop Rosati who assured them that missionaries would be sent when funds and missionaries were available. In 1835 and 1837 the Salish dispatched men again. Finally in 1839 a group of Iroquois and Salish met Father DeSmet in Council Bluff, IA. He promised to fulfill their request the following year. He finally arrived two years later in Stevensville on September 24, 1841 and called the settlement St. Mary’s. He immediately built a chapel, then log cabins and Montana’s first pharmacy. In 1850 Major John Owen arrived in the valley and set up camp north of St. Mary’s. He established a trading post and military strong point named Fort Owen, which served the settlers, Indians, and missionaries in the valley. In 1853 territorial Governor Isaac Ingalls Stevens spent time surveying the area as he slowly moved west following Lewis & Clark’s trail. 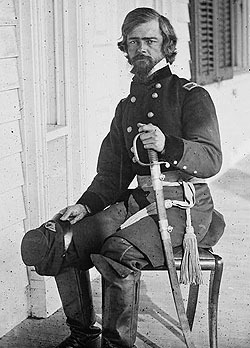 He was called back to active duty with the Union Army. He was killed in action in 1862 at Chantilly. In 1864 St. Mary's was changed to Stevensville in his honor. The area of Darby was first settled in 1882. The Northern Pacific Railroad’s expansion in Montana between 1883 and 1887, resulted in the completion of seven branch lines. One was the Missoula & Bitter Root Valley Railroad, which ran from Missoula, through Victor and Hamilton, ending in Darby. (Rails to Gold and Silver Vol. 1, Bill and Jan Taylor, 1999.) In 1888 Postmaster James Darby named the town after himself. The name stuck. One of Marcus Daly’s projects was a canal and ditch system for irrigating his land. It was abandoned after his death. In 1905 Samuel Dinsmore continued the concept and started developing the "Big Ditch", an 80 mile irrigation project from Lake Como (Northwest of Darby) to Florence, just north of Stevensville. After running into financial difficulty, it was reorganized with the help of Chicago financiers W. I. Moody, Frederick D. Nichols (1906 - S.118) and others and renamed the Bitterroot District Irrigation Co. By 1904 Moody was General Manager of the Muncie Works, producing Iron and Steel as well as operating Natural Gas Wells. Their offices were in the Rookery Building in Chicago. Wright remodeled the Rookery in 1905 (S.113). Moody visited the Bitterroot Valley in 1905. 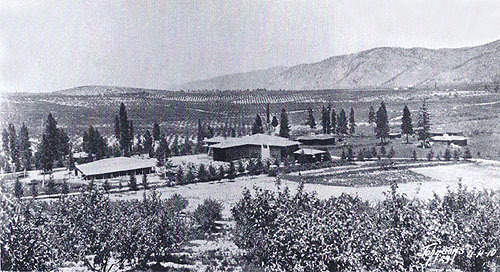 By 1907 they had purchased and sub-divided large sections of the valley into 10 acre parcels for fruit orchard development. They paid $2.50-$15 per acre and resold "apple orchard tracts" at $400-$1,000 per acre. The company quickly became rich. By 1909 three rail lines ran to Missoula, Montana. The Missoula & Bitter Root Valley Railroad connected Missoula on the North with Darby on the South end. Land, transportation and water. A perfect combination. 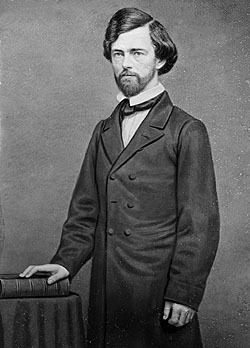 Most likely because of Nichols’ relationship with Wright and Moody’s knowledge of Wright, he was hired to design two developments. Como Orchard Summer Colony and the town of Bitter Root (S.145) . In February 1909 Wright, Moody and Nichols visited the valley (FLWNL). The first of the two developments, the Como Orchard Summer Colony, consisting of the Master Plan, the Clubhouse and Inn, Cottages and the Manager’s Office. Developed for the Como Orchard Land Company, a subsidiary of the Bitter Root Valley Irrigation Company, they were marketed to University of Chicago Professors as "University Heights Community and Orchards." The area is still called University Heights today. Purchase five to ten acres and a cottage, and the company would manage the orchard and market the crop. Perfect for a professor. Vacation for three months and enjoy the Bitterroot Valley. The Clubhouse was conceived as the center of the community. It consisted of two communal Dining Rooms, one on either side, a two story lounge in the center for gathering, three fireplaces, guest bedrooms upstairs, a kitchen and servants rooms, and large porches that ran the length of the front. A open balcony overlooked the lounge. 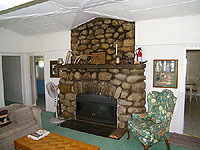 With communal Dining Rooms in the Clubhouse, most Cottages were designed without kitchens. All buildings were board and batten, the windows were designed with wood mullions. An irrigation channel from Lake Como ran through the development’s 1600 acres. Of the over fifty cottages that were planned, twelve were constructed. Today, one Cottage and the Manager’s office remain and are maintained. 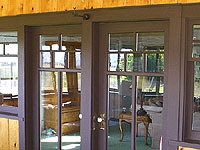 There were many classic Prairie styled Wright details in the Clubhouse and original Cottages. 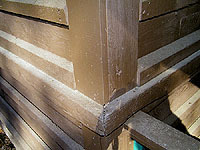 The basic material was wood, utilizing horizontal board and batten siding. Strong horizontal lines, low-pitched roof, broad overhanging eaves, horizontal rows of mullion divided glass windows and glass doors, centrally located stone fireplaces and chimneys, balconies and porches. 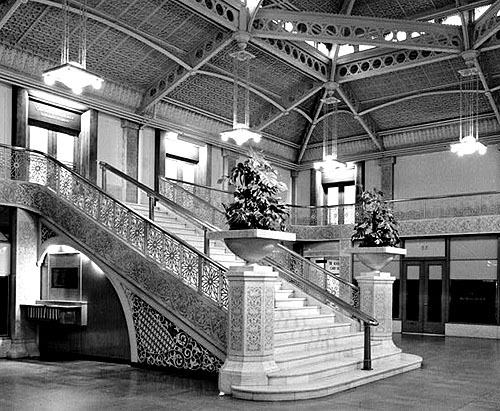 Wright designed built-in planters like many of his buildings at that time, but they were eliminated when constructed to keep costs in line. 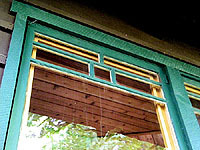 Although the Cottages were economically built, Wright details still exist. 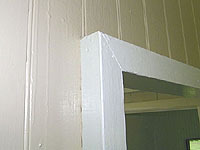 Partition walls like those he designed in Usonian homes. Mullion windows, stone fireplaces and designed ceiling details. They were built as summer Cottages so lacked central heating. Wright visited the site in February 1909, construction began in May. One of Wright’s drawings of the Clubhouse was a winter scene, no doubt a result of his February visit. 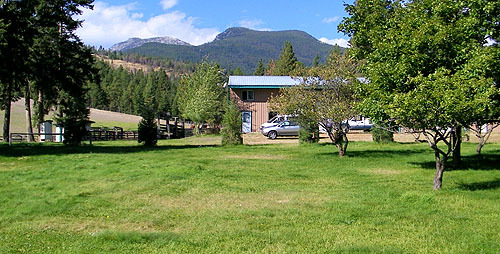 Where as the first development was conceived more as community, the second development for the Bitter Root Valley Irrigation Company was the site plan for the town of Bitter Root. The only structure built was the Bitter Root Inn. It opened in October of 1909. Sales was aimed at the wealthy. The "apple boom" was on. Investors from the east were wined and dined. They were given free rail passage and transportation where they were lavishly entertained at the Bitter Root Inn. Lodging, dinner and golf were free. So was the French wine. The boom was short lived. Blight destroyed much of the valley’s crop in 1913. Law suits plagued the company. They filed for bankruptcy in 1916. In 1923 the McIntosh-Morello Orchards became the new owners. The Clubhouse became a storage and packing facility for the new company and the bedrooms were used for seasonal workers. It also failed and the Clubhouse was finally dismantled in 1945. Other Cottages were destroyed over the years. Only two original building survive today. One three bedroom Cottage and the Manager’s Office. Little remains of the "dreams" and "schemes" of the Como Orchard Summer Colony near Darby, Montana. A cursory glance reveals little of Wright’s original designs. Dreams change, memories fade, time passes, life goes one. But if not for the dreams of Moody, Nichols, Wright and a few University Professors that caught that dream, the Como Orchard Summer Colony would never have been conceived and built. The Chicago Alumni Magazine - March 1908 "An Unusual Opportunity." Half page ad for the Como Orchard Land Co. "University Heights, Community and Orchard... with a plan of providing for each investor a summer cabin in an attractive village community. A few Five and Ten-Acre Tracts still available in he division reserved for the University of Chicago..."
Original floor plan copyright 1993, “The Frank Lloyd Wright Companion” Storrer, William Allin, page 145-147. Modified by Douglas M. Steiner, Copyright 2009. Wright visited the Como Orchard site in February 1909. Wright illustrated the Clubhouse as a winter scene, no doubt a result of his visit. Construction began in May 1909. Courtesy of the Frank Lloyd Wright Foundation. 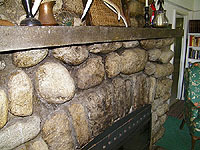 Few photographs exist of the Clubhouse. Construction began in May 1909. By early 1910 construction was complete. The inscription in the image below indicates that it was photographed in 1923. There is a white "sign" visible in the second Lounge window from the right in this image and the one below. The landscaping in the foreground is also consistent in each image. After 35 years, the Clubhouse was dismantled in 1945. "Johnsons 23 UH" is inscribed in the bottom right hand corner. In 1923 the McIntosh-Morello Orchards became the new owners. 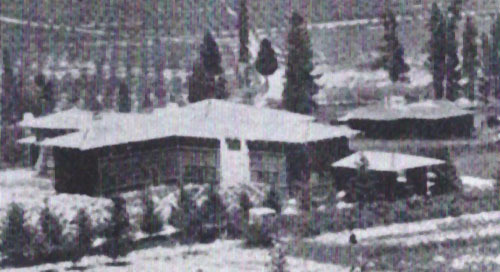 The Clubhouse became a storage and packing facility for the new company and the bedrooms were used for seasonal workers. There are two similarities with this image and the one above. There is a white "sign" visible in the second Lounge window from the right, and the landscaping in the foreground is also consistent. These images could have been taken to promote the new McIntosh-Morello Orchards. "Johnsons '29 U-H-10" is inscribed in the bottom right hand corner. The Clubhouse is in the center of the photograph. To the left most likely is a barn erected for horses and storage for the orchards. Five cottages can be seen in the background on the left and the right. Fruit trees are visible as-far-as the eye can see. Detail of the Clubhouse in the center. To the right is the three bedroom cottages that still exists today. The original Clubhouse was dismantled in 1945. A new metal-sided barn was erected on approximately the same site. Compare mountains in the background to those above in the circa 1923 image. "On his return and until the first of May, Wright designed (the community's) central clubhouse, all of the cabins, and the site plan for the Heights. 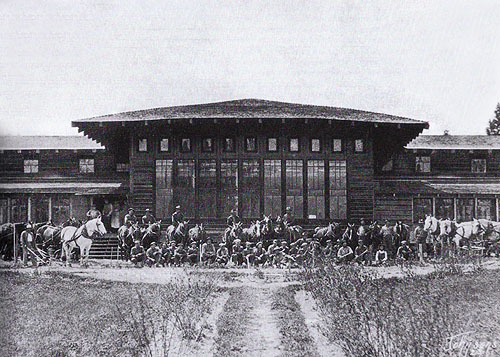 ... Wright's drawings are dated April 1909, construction of the clubhouse began on May 5, 1909, and very soon thereafter work began on 12 cabins. By March 1910 all were complete, and all fit the aesthetic model of Wright's personal style." 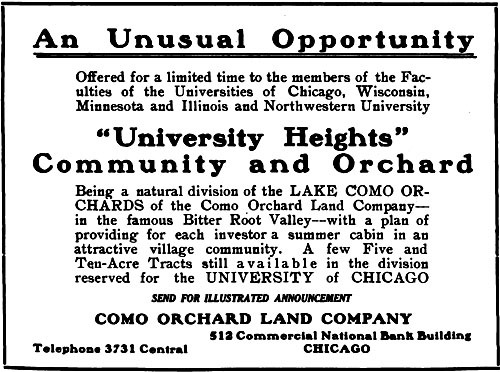 The Como Orchard Summer Colony was marketed to University of Chicago Professors as "University Heights Community and Orchards." The area is still called University Heights today. Purchase five to ten acres and a cottage, and the company would manage the orchard and market the crop. Perfect for a professor. Vacation for three months and enjoy the Bitterroot Valley. The Clubhouse was conceived as the center of the community. It contained two communal Dining Rooms and a two story lounge in the center for gathering. 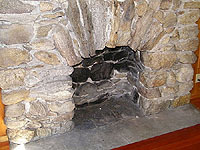 As a result, most Cottages were designed without kitchens. Of the over fifty cottages that were planned, twelve were constructed. 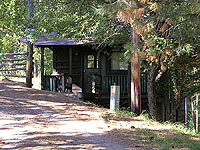 Today, one Cottage and the Manager’s Office remain and are maintained. "The Last Cottage of Wright's Como Orchard Complex"
Until the early 90s very little had been written, documented or photographed that pertains to the Como Orchard Summer Colony. With that said, there is a very important article documenting the condition of the Three Bedroom Cottage in 1982 written by Grant Hildebrand and Thomas Boswoth. "The Last Cottage of Wright's Como Orchard Complex" published in the Journal of the Society of Architectural Historians, December 1982, Pp 325-327. Because of its "bad condition" the owners scheduled it for demolition. They contacted "the University of Washington to discuss either moving the building or recording it." Because of the condition, size, difficulties of transport and later changes to the cottage, the decision was made to "record the building in its hypothetical original state." Published monthly by The University of Chicago Alumni Association, The University of Chicago, Chicago. Advertisement for Como Orchard Land Co. P 21. "An Unusual Opportunity." Half page ad for the Como Orchard Land Co. "University Heights, Community and Orchard... with a plan of providing for each investor a summer cabin in an attractive village community. A few Five and Ten-Acre Tracts still available in he division reserved for the University of Chicago..."
"The Last Cottage of Wright’s Como Orchards Complex." Michels, KirkPp 325-327History of Hamilton, Montana and the surrounding area. 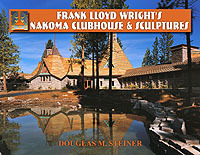 Includes historical information on the Big Ditch Development, the Bitterroot District Irrigation Co., and the two planned communities designed by Frank Lloyd Wright, which included "University Heights near Darby and the town of Bitterroot near Corvallis." "Montana’s only Frank Lloyd Wright designed guest ranch, retreat and wildlife refuge - the historic and unique Alpine Meadow Ranch... In 1910, Frank Lloyd Wright was commissioned to design a development that would allow people from the city to live in the mountains, pick apples, socialize, and live in a little utopia. 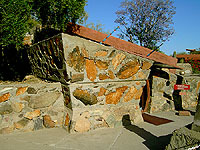 It is believed that Wright visited the site to select the locations of the dwellings." Includes three photographs and one illustration. 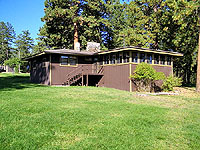 "Montana’s only Frank Lloyd Wright designed guest ranch, retreat and wildlife refuge - the historic and unique Alpine Meadow Guest Ranch, LLC... In 1910, Frank Lloyd Wright was commissioned to design a development that would allow people from the city to live in the mountains, pick apples, socialize, and live in a little utopia. 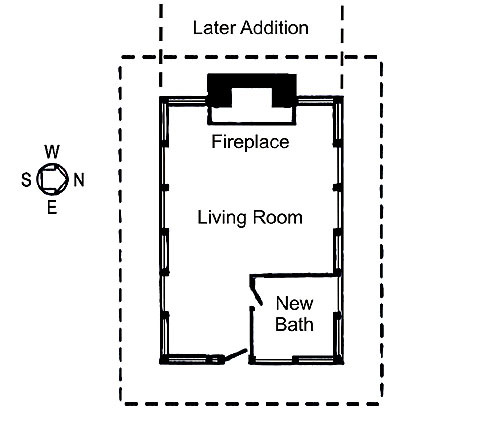 It is believed that Wright visited the site to select the locations of the dwellings." Includes nine photographs and one illustration. "The Iron and Steel Works of The United States" 1904, P 468. "Ausgeführte Bauten und Entwürfe von Frank Lloyd Wright". 1910. 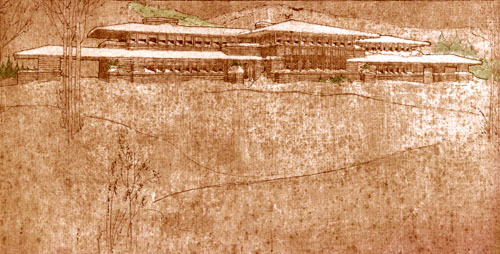 "In The Nature of Materials, The Buildings of Frank Lloyd Wright 1887 - 1941", 1942, Hitchcock, P 55, Plate 167. 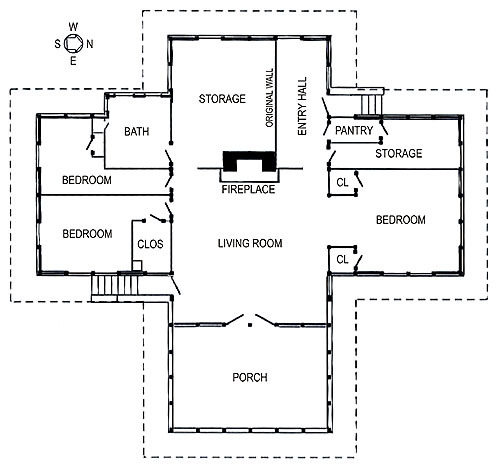 "An American Architecture", Wright, 1955, page 64. "Frank Lloyd Wright to 1910, The First Golden Age" 1958, Manson, Pp 205 - 207. "Frank Lloyd Wright: A Study in Architectural Content" 1966, Smith, Pp 84, 89-90. "Frank Lloyd Wright: An Interpretive Biography" 1973, Twombly, Pp 179. "Frank Lloyd Wright, His Life and His Architecture" 1978, Twombly, Pp 224-225. "National Register of Historic Places, Hamilton, Montana" 1988, Kirk, P 21. Edited and Photographed: Futagawa, Yukio, 1991, pages 92-93, 96. "National Register of Historic Places, Stevensville, Montana" 1991, P 30. "The Wright Space, The Pattern & Meaning in Frank Lloyd Wright's Houses" 1991, Hildebrand, Pp 172n24, 176n13. “The Frank Lloyd Wright Companion”, Storrer, 1993, Pp 145-147. "Frank Lloyd Wright: Architect", Riley, Reed, Alofsin, Cronon, Frampton, Wright, 1994, Pp 63, 91, 96, 328. "Lost Wright", Lind, 1996, Pp 110-111. "Frank Lloyd Wright - Field Guide, Volume 3, West", Heinz, 1999, P 66.